A great number of households have bicycles, from road bikes, standard mountain bikes to kid’s bikes. Some families use them every day, others rarely use them. For bike riders, storing bikes in tight quarters can be an invitation for all sorts of potential problems. Plus, you need to consider wherever you would like to stay your bike—inside or outside, before you are taking associate actions to store your bikes. It’s fortunately that there’s a good vary of solutions on the market to store away your bikes. When the walls still don’t provide enough storage space, ceiling is a good way to go. 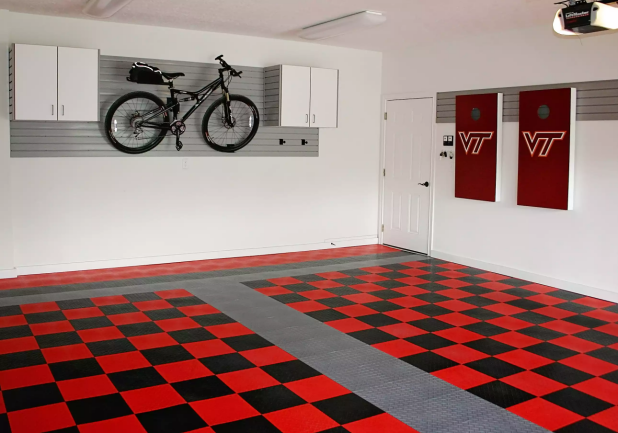 No two garages are the same, so choose a ceiling storage with adjustable heights to fit your needs or garage space.There are several types of ceiling or overhead bicycle storage available. One is garage utility hangers, made of tubular steel which is sturdy. It’s easy to install. There are two holes on the left side and two holes on the top. Just make a small mark where the center of the screw will go, and drill a hole in the spot(s) you marked. 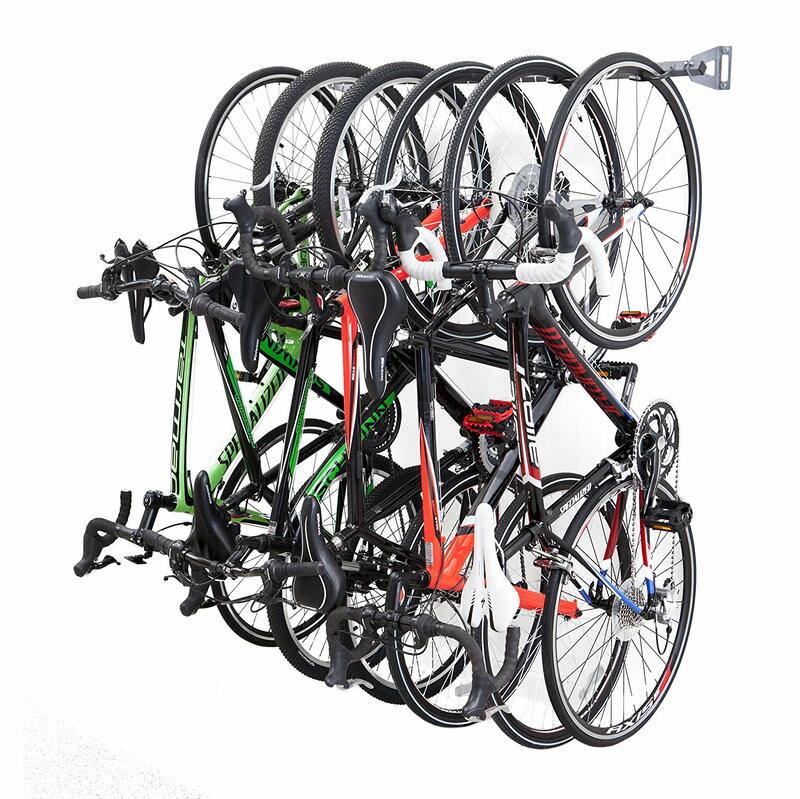 In addition, heavy-duty ladder hooks can safely hold bikes of 30 pounds or more when properly installed. The second is horizontal bike lift, of which hooks are designed with a rubber coating to protect your bicycle from scratches. Robust engineering allows you to lift heavy bikes--75lbs up to 12ft above floor. All you need to do is to simply attach one hook to the handlebar and the other to the seat, then hoist your bike to the ceiling. A safe locking mechanism prevents unwanted accidental release, just making this great for heavy bikes that are harder to lift. 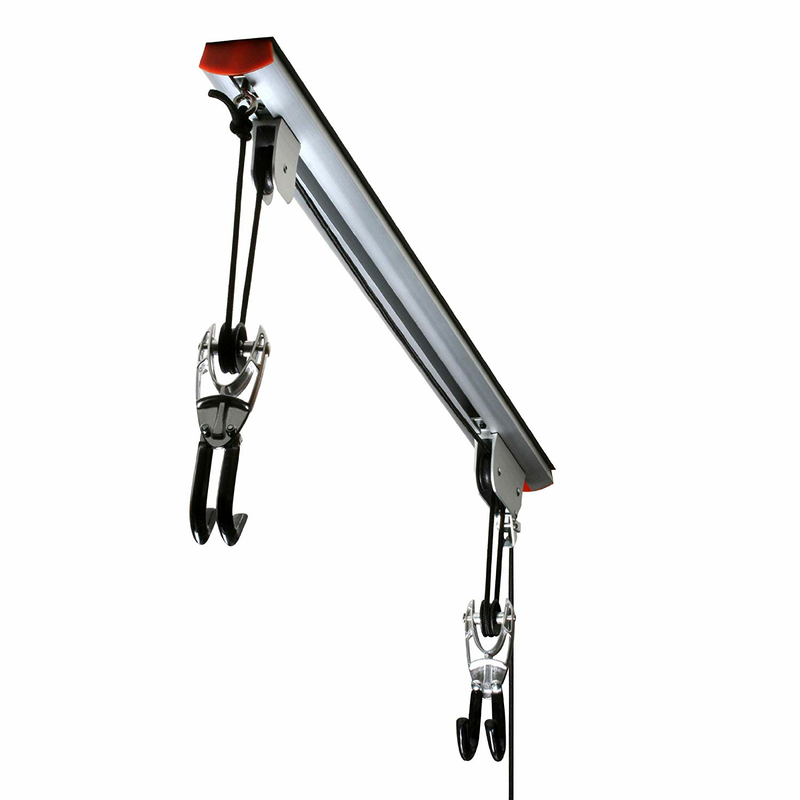 The last one is overhead 50 inch track, coming with 5 rubber coated hooks. Additional hooks are available for purchase in various sizes, in 50, 74 or 98 inch lengths. 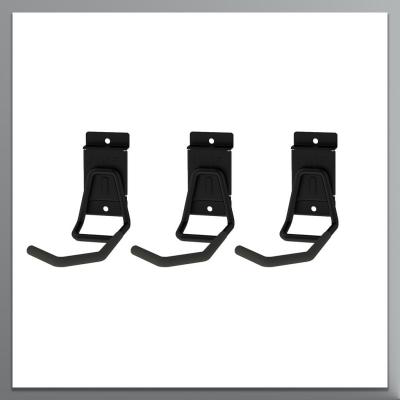 Mounting hardware track can hold up to 50 lbs per hook. Hooks slide and rotate for easy adjustability. The downsides with this type of system are as following: first, they require a bit of effort to install; second, you risk bending the rim if you hang road bikes long term this way. It's best to hang those by the frame, seat or handlebars. If you're going to hang standard mountain bikes or BMX bikes, this is great choice. If you like your bikes to be accessible on the wall and clear the hallways because you don't want to dismount them from overhead, try the following devices for stashing and securing your rides. If you don’t want to drill any holes in the wall or ceiling, or you can’t drill holes in the walls—that’s to say, your rented apartment, vertical bike stands, with tension between the floor and the ceiling, will be well worth your time and dollars. 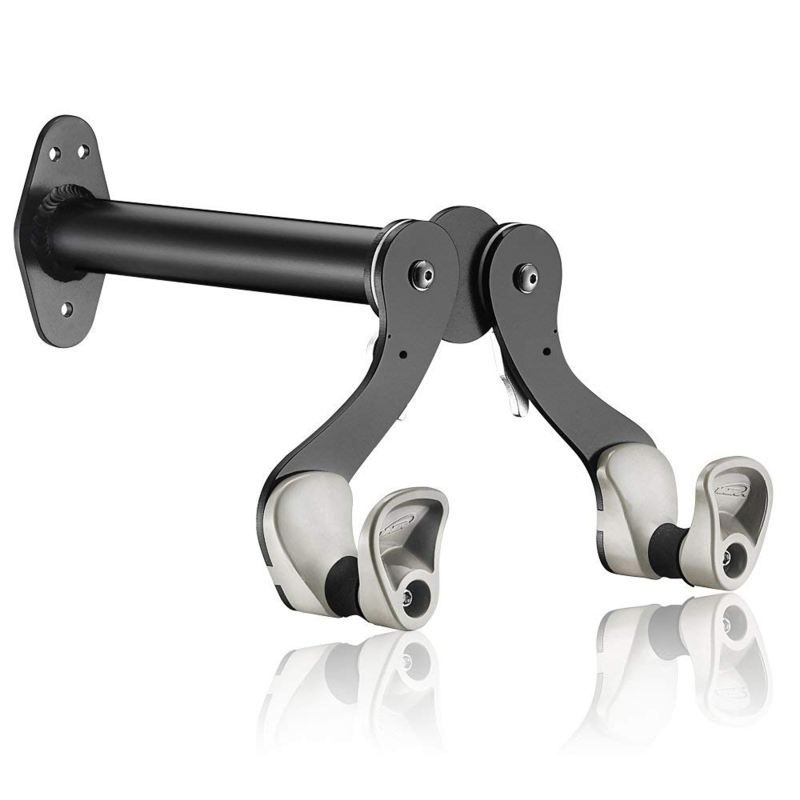 They are very easy to install, work well with step-through or mixte frames as well. However, just make sure to have enough space in your garage for your bikes to hang away from the wall and still get in, out, and around your vehicles. 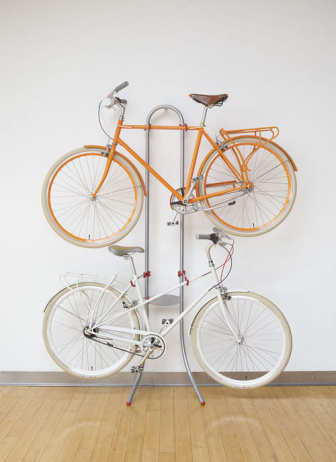 This freestanding storage system, whose body is powder coated light steel, is a good option for those who only want their bikes to stay upright without leaning it on the wall. If you are renting an apartment or simply prefer to avoid drilling, consider this tidy stand whose double-decker feature can save a ton of space by carrying two bikes. It satisfies any type of bike just by employing a massive base to support itself. 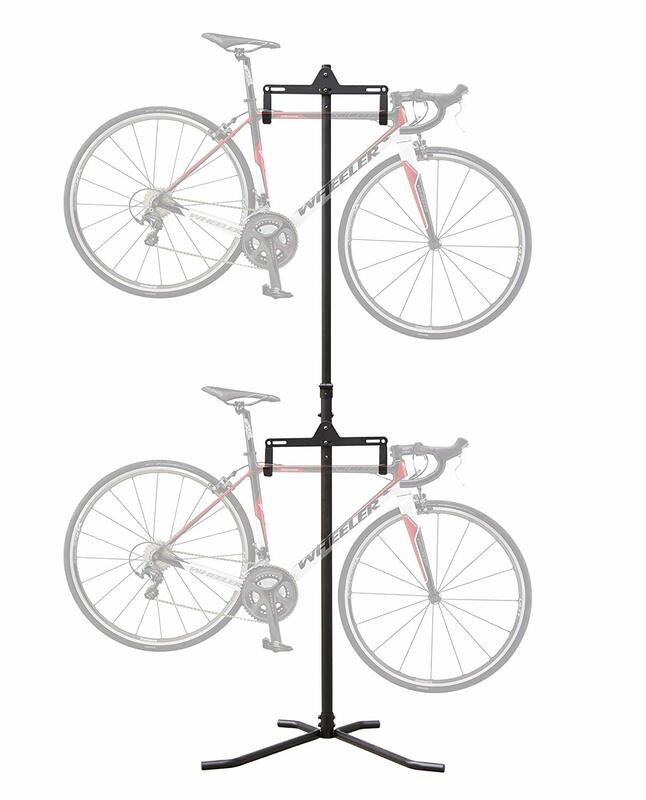 If you are seeking for bike storage that can move easily — whether you're rearranging the garage or moving houses — think about a solution like free stands. Plus, it is a good investment for a simple commuter to go to work each morning for which that it’s be hold on handy. 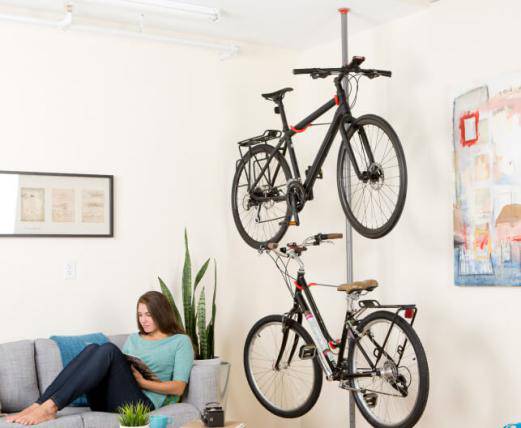 A new innovation—gravity stand—add to one’sdoable possibility for bicycle storage concepts. We don’t need any tools or hardware here — this stand-up rack leans against the wall for support. f you reside in an exceedingly tiny flat or haven't any garage, this stand is a perfect space saver to store bikes indoors by holding two bike frames firmly to the wall. With horizontal arms, that may be simply adjusted to suit any frame vogue for two bikes. 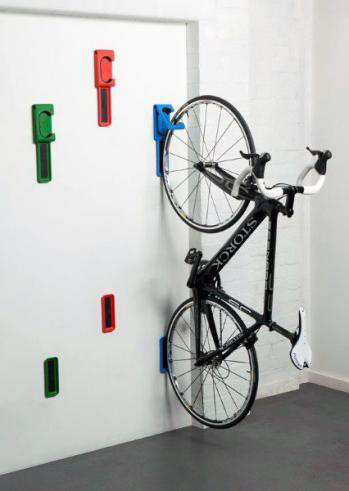 The wall mount systems usually consist of clever indoor bike racks and hooks that are drilled or screwed into the wall. 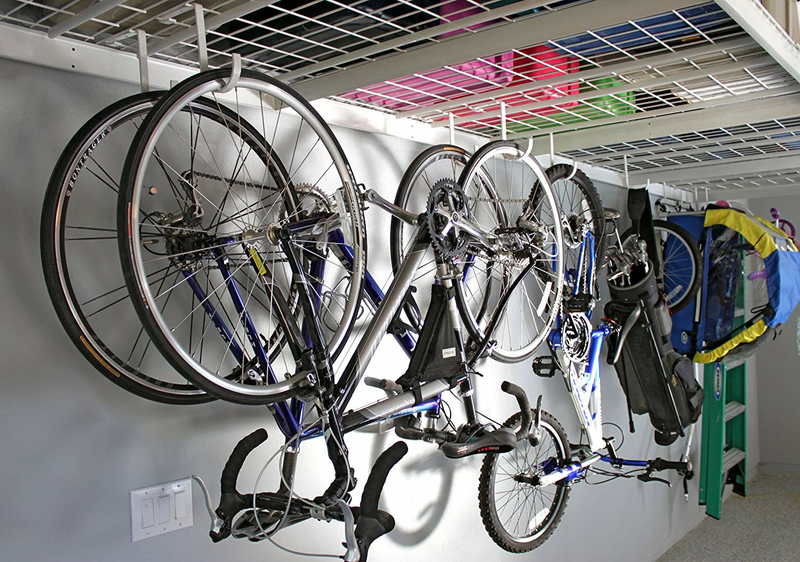 As one of the most common types of indoor bike storage, there are two different types: horizontal, which hangs the bike by its frame, and vertical, which utilizes the front or back rim. 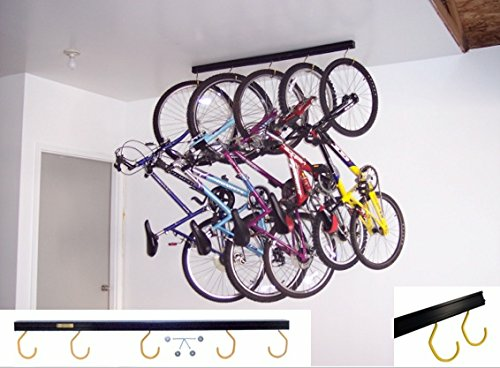 Monkey bars keep your bike lifted and out of your way by hanging it from a rack or holder that is permanently affixed to your wall. Each bike hook (supporting up to 75lbs) slides on bar for easy adjustability. 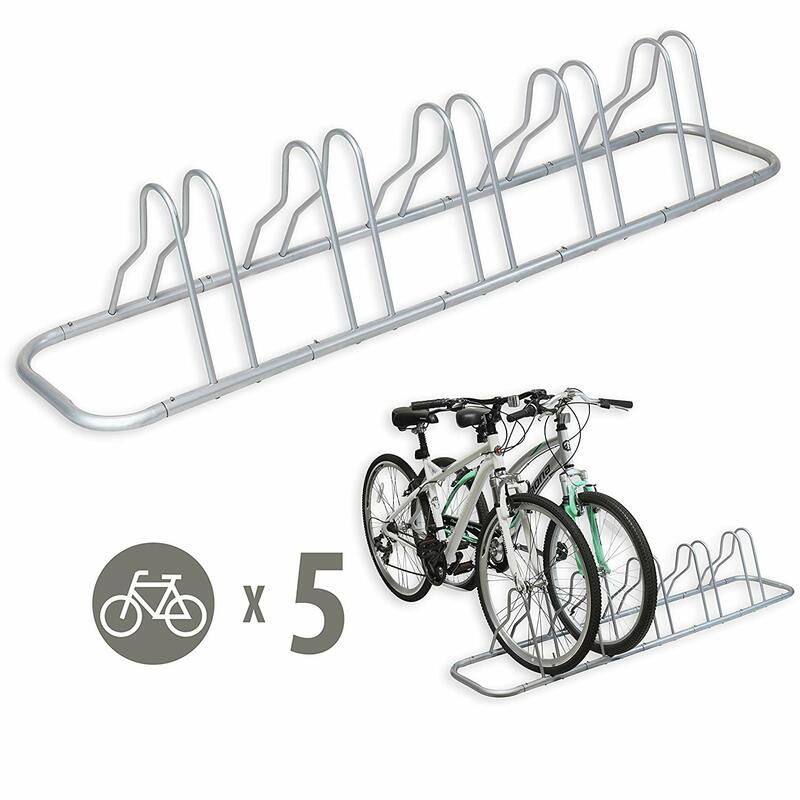 Not only can our bike storage rack hold six of any types of bikes, but you can also use the hooks to hold helmets, pumps, or cycling shoes and so on. It installs in just 15 minutes for a long term solution. Even if it solve the frame-incompatibility problem by hanging the bike by its wheel, storing them in a long time will bend the rim. Clugs/hooks/hangers shield your bikes and create valuable floor space by getting them off the ground. Installation is in minutes. After they are tightly put as high and as low as you like on the wall, you can attach your bike to them no doubt. As the tiniest bike storage option on the market, the clug, an itty-bitty wheel clip, attaches directly to your wall. What you need to do is to simply slide your wheel into the clip, and then the bike will be held in place. As the cheapest indoor bike storage option, wall-mounted bike hooks grab onto the front wheel and allow the back wheel to rest on the wall. Wall-mounted bike hangers are incredibly easy to install, just simply drilling it into a stud and then mounting your bike off the hanger. They are very solid when in use. Do you think about your gears like helmet, gloves and bags when you hang your bike? Do-it-yourself bike shelf lets you hang any bike by its crossbar while providing space to organize your biking accessories. Although it’s more work to install than any other bicycle organizers, yet it turns your bike into an art piece in a home with limited space. For the DIY lovers, the process to build their own bike shelf, including swinging a hammer and having access to a few good tools, is a fun and satisfying endeavour, and the best way to get the bike shelf of their dreams. 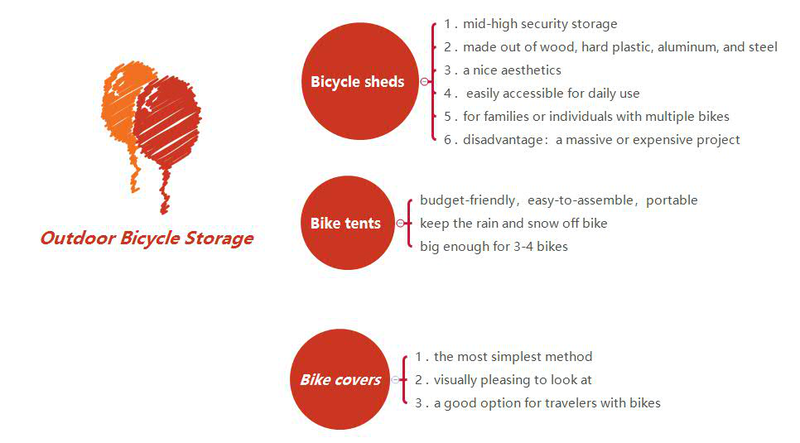 Bike storage is a energy-consuming and time-consuming business. Not only because it’s difficult for bike owners to find a storage solution to accommodate different types of bike frames, but also because sometimes you might be refrained from drilling a couple of new holes in the drywall. With bike stands you won't have to worry about that. 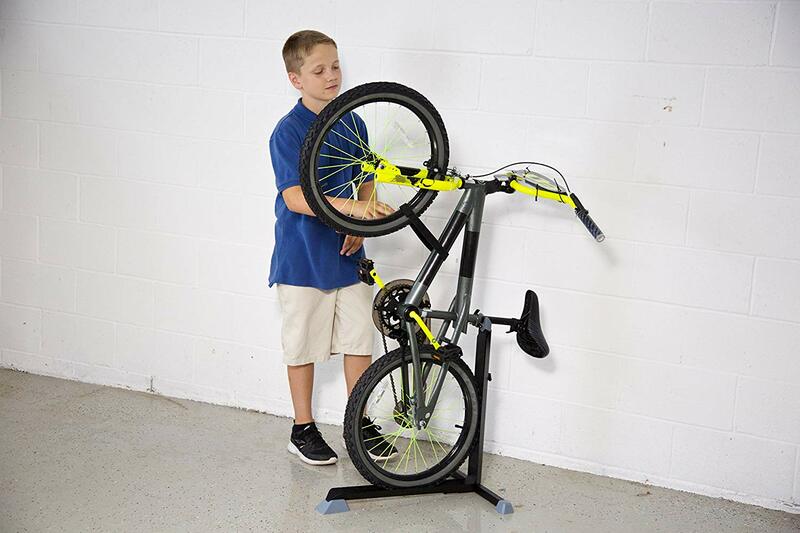 If you have floor space, consider a low-cost bike stand, like the floor stand from Coolyeah. They’re easy-to-use, and quite portable. You can easily load your bicycle in from the front to rear wheel without scratching the bike's rims. As a consequence, this is a particularly good method for storing kids’ bikes. Homeowners cannot rely on kids to hoist their bikes onto a wall hook due to their weight. Additionally, they’re also a good choice for people who bring their bikes to the office for whey are stored within reach. Garage wall panels, like slatwall, pegboard and gridwall, are a good way to provide a safe place for your bikes. Frees up the floor space for the rest of your gears by storing your bike off the floor and out of the way. If you have kids, hanging a panel (gridwall, slatted wall, peg-board) close to the ground makes it easy for little ones to lift their bike into its place and works almost as well as the parking spot. The adjustable tool holders and organizers get hooked on these functional feature walls so that you have clear access to related ‘clutter’, such as bike lock, helmet. These lumber boards create a visually aesthetic bike parking installation. The only downside of wall systems, however, is that you need to make sure the panels are secured tightly to the wall in case that the bike falls down. If you don’t have a garage for storing their bikes, or your garage doesn’t have enough free space inside for easily storing bicycles, bike sheds in backyard are one of the best choices for families or individuals who are looking for outdoor mid-high security storage. They’re made out of wood, hard plastic, aluminum, and steel. Create a nice aesthetics and keep it easily accessible for daily use. 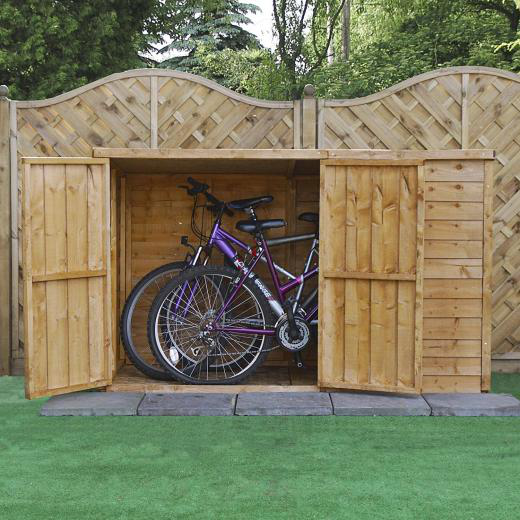 As one of the best choices of outdoor bike storage for families or individuals with multiple bikes, these tidy isolated units shield your bike from the bad weather and add much security against theft. The only drawback of building a shed is a massive or expensive project. 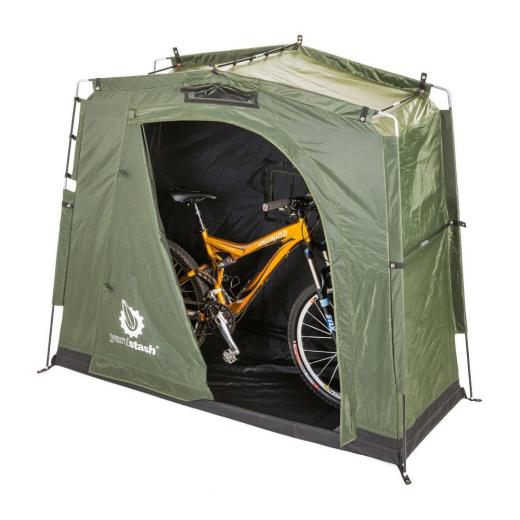 Bike tents are a budget-friendly, easy-to-assemble and portable outdoor bike storage option for people who are looking to keep the rain and snow off your bike.. They’re a good option for people in areas with minimal or no risk of bike theft. Moreover, they are suitable for those who travel with their bikes because of their handling most of the impacts associated with traveling, such as theft, harsh sun and foul weather. Under normal circumstances, the tent would be big enough for 3-4 bikes, but the size really depends on how many bikes you’re planning on storing. When it comes to outdoor bike protection, a cover is the most simplest method than the other two methods mentioned above. Cover-up tactic is another outdoor bike storage option to keep it out of the way while making sure it is also visually pleasing to look at when you need it. 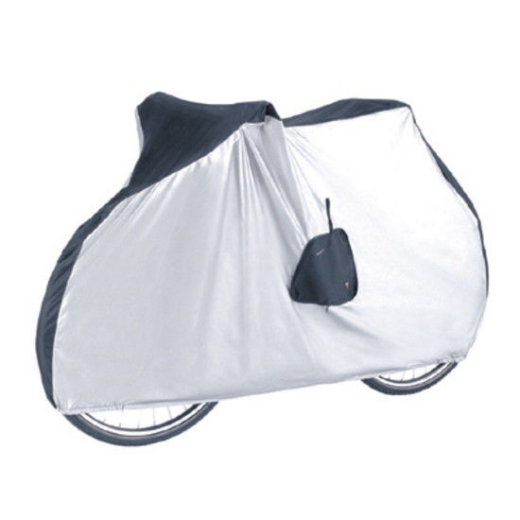 A cover might be a good option for travelers with their bikes if they need an easy storage option while on the road to maintain their bikes dust-and grime-free, and protect from accidental scratching or scraping of the bike. Do you have any good ideas on Bike Storage Inside and Outside? Welcome to discuss with us. We invite you to join our growing family at CoolYeah Garage and to continue with us on our journey to inspire some of the innovation of tomorrow with fun, hands-on experiences.